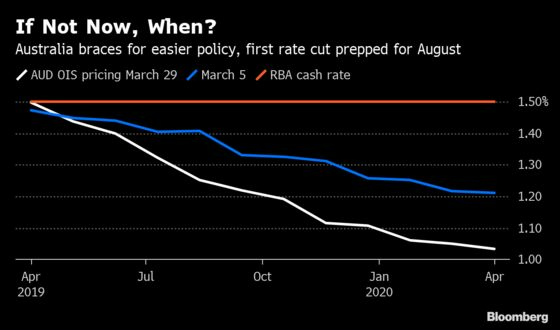 From Australia to South Korea and New Zealand, interest-rate swaps are telegraphing the same message: borrowing costs are set to fall across Asia Pacific. As the region’s export momentum wanes and the Federal Reserve’s dovish turn reverberates across the globe, traders are lining up bets on which central banks will be the first to ease policy. In Australia, positions in the futures market have surged and overnight rate swaps are pricing in a 25-basis point cut in August, followed by another reduction in the first quarter of next year. Traders are speculating policy makers may be forced to act even as the labor market -- a key indicator for the central bank -- remains robust. Economic growth may slow further after falling to a two-year low in the final quarter of 2018, amid a worsening property slump and weakening demand for the nation’s commodities. Focus is now on the federal budget due Tuesday, to see if the government offers tax breaks and cash handouts to prop up spending. 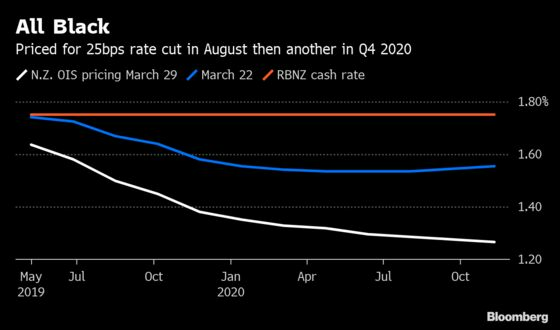 The Reserve Bank of New Zealand laid the groundwork for its first rate cut since 2016 last week, when it abruptly shifted to an easing bias. After the March 27 review, Governor Adrian Orr said the next move is more likely to be a reduction, as the global outlook weighs and core inflation remains below the midpoint of the central bank’s 1-3 percent target range. Orr reaffirmed the dovish outlook two days later, saying RBNZ’s new stance on interest rates will be “the starting point” for deliberations by the monetary policy committee. Overnight rate swaps indicate markets are pricing a 25-basis point reduction in August, and further easing in the final quarter of 2020. 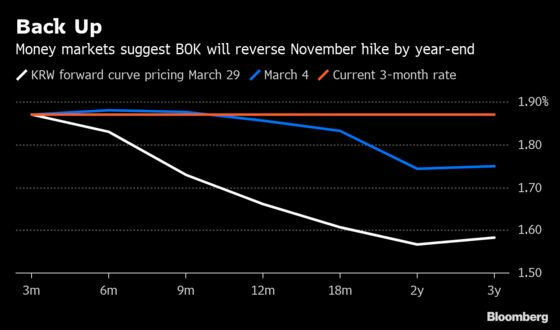 If traders are right, the Bank of Korea is on track to reverse the 25-basis point increase it delivered last November. Money market pricing suggests policy makers will act later this year, amid a deepening slump in exports and factory output. Three-year South Korean yields dropped below the benchmark interest rate for the first time since 2016 last week. On Monday, Governor Lee Ju-yeol warned the weakness in the semiconductor sector may persist for longer than expected, but added it’s not yet time to weigh an easing as the current interest rate is not a constraint on the economy. Subdued inflation -- consumer prices rose at the slowest pace in almost three years last month -- may strengthen the case for lower borrowing costs.